This is Queen Liliuokalani's translation of the Hawaiian Creation chant, the Kumulipo. She translated this while under house arrest at Iolani Palace, and it was subsequently published in 1897. This is an extremely rare book which was republished (in a very scarce edition) by Pueo Press in 1978. The Kumulipo's composition is attributed to one of Liliuokalani's eighteenth century ancestors, Keaulumoku, just prior to European contact. It is a sophisticated epic which describes the origin of species in terms that Darwin would appreciate. The Kumulipo moves from the emergence of sea creatures, to insects, land plants, animals, and eventually human beings. It describes a complicated web of interrelationships between various plants and animals. The most massive part of the chant is a genealogy which enumerates thousands of ancestors of the Hawaiian royal family. The Kumulipo is also available at this site in the 1951 translation of Martha Warren Beckwith, with comprehensive analysis and the complete Hawaiian text. However Liliuokalani's version is of some historical significance. 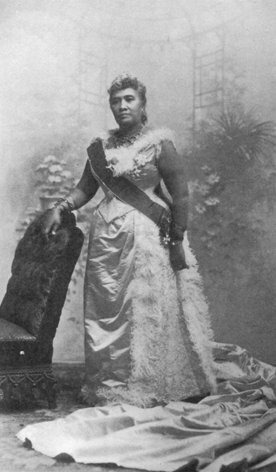 The last Queen of Hawaii, Liliuokalani was extremely literate, and steeped in Hawaiian tradition. She was the author of the well-known Hawaiian anthem, Aloha 'Oe as well as a Hawaiian history book, Hawai'i's Story by Hawai'i's Queen .